What a cool book! Jacinda Scott goes to New Zealand to take time off from the pressures of LA life. She doesn’t bank on staying next door to Liam Ward, cute younger brother of her decade-old teenage fling. 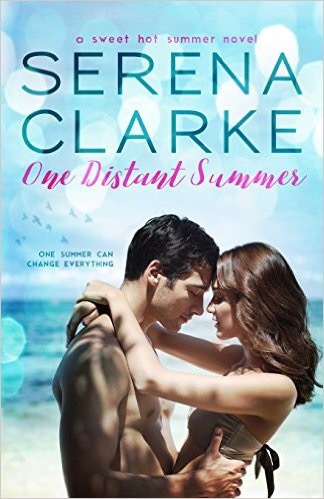 One Distant Summer isn’t a simple story. Author Serena Clarke does a phenomenal job giving us something more than just unrequited love or “I fell for the wrong guy.” Jacinda has her own life with fun and loyal friends. She focuses on a successful career, but not to the detriment of her own welfare. She’s a whole person… who just happens to fall into Liam’s neighborhood. Subplots abound — always in support of the main storyline. Without too much angst, Liam and Jacinda fall in and out of like and lust, trying to determine what will hurt the least. There are lots of gatherings with friends, sandy beach talks, and stolen moments with guitars, as the couple journeys to find a resolution. Serena Clarke successfully takes the reader on that journey — the characters feeling like my own friends, and New Zealand feeling home.